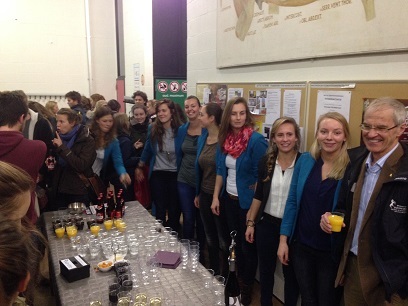 Over 100 students enjoyed a BEVA Sponsored Clinical Club talk at the University of Ghent last week. The students welcome Professor Derek Knottenbelt, whose presentation was entitled, 'Why is a fat horse is not a fit horse? Some aspects of equine metabolic syndrome?' The evening, which was also sponsored by Hallmarq MRI, who have continued to support the BEVA Vet School Tours for a number of years, also included discounted Membership for attendees and a free raffle, where the lucky students received prizes from the EVJ Bookshop. Sanne Mooren, BEVA representative at the University of Ghent, said, “The BEVA evening was a great success! See the photos below. Around 130-150 people were present (some attended later so we didn't know how much exactly) and the lecture from Prof. Derek Knottenbelt was very good and entertaining, he is a fantastic speaker! The students really liked the tombola and the reception after the lecture. Thank you, to BEVA and Hallmarq [sponsors of the event] for making this great evening possible! And of course Prof. Derek Knottenbelt!"